Soil organic matter is the focus of much ongoing research because, in addition to being a fundamental driver of soil fertility, more than half of its mass consists of carbon (about 58% on average). The carbon locked in soil organic matter contributes to sequestering carbon away from the atmosphere. This means that soil organic matter can help regulate atmospheric carbon dioxide concentrations and attenuate global warming (Lal, 2004). Soil organic matter is really just a fancy word for dead and partially decomposed plants, soil animals, and microbes, so it is not surprising that the greatest concentrations are found near the soil surface, where most of the organisms live. Yet a significant proportion of soil organic matter travels downwards in the soil, aided by organisms and water flow. In mountain soils of Canada, Grand and Lavkulich (2011) have calculated that sixty percent of soil organic matter is actually found in the subsoil at depths greater than 20 cm. Because researchers have traditionally focused on the topsoil layers, little is known about the processes influencing deeper soil organic matter pools (Rumpel and Kögel-Knabner, 2011). In their 2018 article, Matteodo et al. investigated a large range of mountain soils to determine the concentration as well as the thermal stability of organic matter in topsoil and subsoil layers (Fig. 1). The thermal stability of organic matter is measured by gradually heating the soil up to 850°C in controlled atmospheres and is indicative of organic matter dynamics (Sebag et al., 2016). The authors also compiled detailed information about each site, including climate, vegetation, humus form (related to the activity of soil animals), soil texture (the size of mineral particles), soil chemistry, and geological substrate (the nature of the rocks from which soils developed over time). Fig. 1: Magalì Matteodo and her research advisor Dr. Pascal Vittoz ponder the different processes controlling soil organic matter accumulation in the different layers of the soil. Magalì has since earned a doctorate in the field of plant-soil interactions. Image republished with permission from Magalì Matteodo. They found a clear divergence of controls on soil organic matter dynamics between the soil layers. In the topsoil, the thermal stability of organic matter was predominantly influenced by biological and biochemical factors, such as the elemental composition of the organic matter or the humus form. More interestingly, none of these biochemical or biological factors were important in subsoils; in deeper layers, organic matter dynamics were chiefly influenced by soil minerals. The main predictors of the thermal stability of organic matter in subsoils were soil texture, soil acidity, and the nature of the geological substrate. In subsoils, organic matter is rarely found in isolation (in “free” forms). Instead, it exists in close association with soil minerals (Fig. 2). The interaction of the organic matter with minerals protects it from the activity of decomposing organisms and enhances its stability. Matteodo et al. (2018) provide compelling evidence that mineral properties, such as size and composition, are the first-order control on organic matter transformations in subsoil layers. Fig. 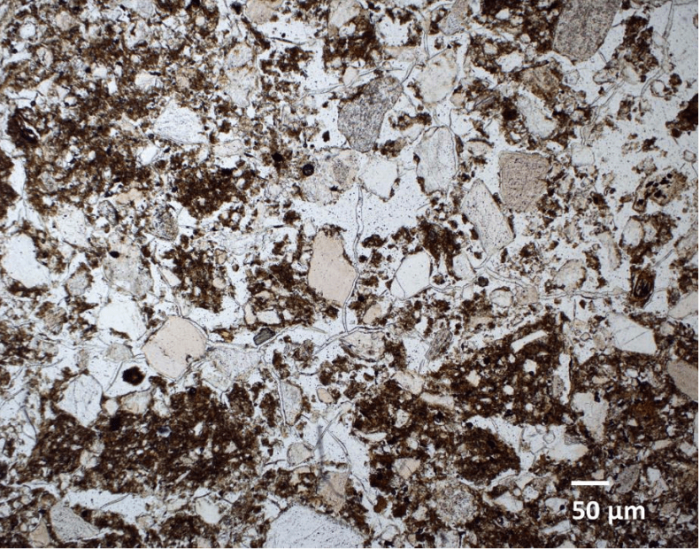 2: Microscopic view of a subsoil showing the close association of organic matter (in dark brown) with soil minerals. Organic matter shows little interaction with relatively large, silt-sized mineral particles (white, grey and pale brown grains about 50 µm in size) but instead associates closely with clay-sized particles (<2 µm) to form organo-clay complexes. Image republished with permission from Stephanie Grand. This study suggests the existence of thresholds in controls on organic matter dynamics, with an abrupt shift from predominantly biological to geological control as we move from the topsoil to the subsoil. This decoupling of topsoil and subsoil controls on organic matter dynamics has important implications for our understanding of soil properties and functions. For instance, it means that soils cannot be thought of as homogeneous systems; neither should they be modeled as such. New soil carbon models including separate soil layers with different parametrization should be devised. Finally, this study illustrates that soils represent the interface between the living and the mineral world. 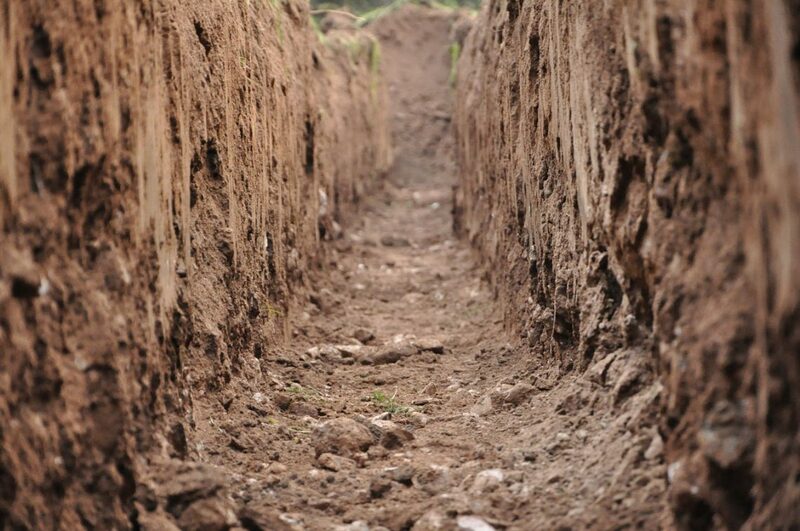 If we are to understand and successfully preserve soils’ life-sustaining functions, we need to account for the complex interactions between the biological and geological processes that occur at the Earth’s surface. 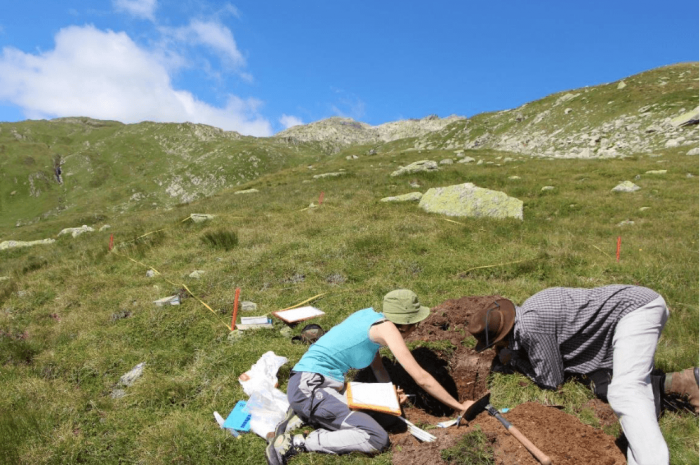 These findings are described in the article entitled Decoupling of topsoil and subsoil controls on organic matter dynamics in the Swiss Alps, recently published in the journal Geoderma. This work was conducted by Magalì Matteodo, Stephanie Grand, Mike C. Rowley, Pascal Vittoz, and Eric P. Verrecchia of the University of Lausanne and David Sebag of Normandie University. This work was part of the Ph.D. dissertation of Magalì Matteodo. Grand, S., Lavkulich, L.M., 2011. Depth distribution and predictors of soil organic carbon in Podzols of a forested watershed in Southwestern Canada. Soil science 176, 164-174. Lal, R., 2004. Soil carbon sequestration impacts on global climate change and food security. Science 304, 1623-1627. Matteodo, M., Grand, S., Sebag, D. Rowley, M.C., Vittoz, P., Verrecchia, E., 2018. Decoupling of topsoil and subsoil controls on organic matter dynamics in the Swiss Alps. Geoderma 330, 41-51. Rumpel, C., Kögel-Knabner, I., 2011. Deep soil organic matter – a key but poorly understood component of terrestrial C cycle. Plant and Soil 338, 143-158. Sebag, D., Verrecchia, E.P., Cécillon, L., Adatte, T., Albrecht, R., Aubert, M., et al., 2016. Dynamics of soil organic matter based on new Rock-Eval indices. Geoderma 284, 185-203. Stephanie Grand is a lecturer at the Institute of Earth Surface Dynamics in the Faculty of Geosciences and Environment, University of Lausanne, Switzerland.